In 2008, the Inter-American Development Bank was struggling. As the global economic recession erupted in the United States and began to spread across the world, the Latin American and Caribbean region waited nervously, bracing for impact and expecting little relief. Despite a declared mission to reduce poverty and inequality and provide critical development finance in a region traditionally hungry for public and private capital, few countries in the LAC region looked to IDB as the primary solution. Then, to make matters worse, as the cause and scale of the recession became clearer, IDB was forced to respond to accusations that the bank recorded $1 billion in losses after reportedly investing as much as 60 percent of its cash reserves into mortgage-backed securities. Beginning in 2006, a Moreno-led organizational restructuring intended to streamline IDB’s operations and create a “leaner and meaner” and “modern” development organization ruffled feathers. There were several high-level reassignments and resignations that threatened morale. Others claimed that changes to the budgeting and loan disbursement processes resulted in weakened and unpalatable social and environmental provisions and safeguards. At the same time, Moreno and his supporters argued that transformation was absolutely necessary if IDB was to compete with emerging lenders in a region yearning for more cost-effective loans with fewer concessions. The oldest and largest multilateral development bank in the world, IDB has been forced to weather a storm of criticism from its member states over the years. In more recent memory, a Brazilian minister was quoted saying simply that “the bank isn’t fulfilling its mission” and his country would push for a “new, more efficient management.” A Chilean government investigating committee once called IDB “careless and irresponsible” in its loan-making. The United States – which is the majority shareholder in IDB and provides approximately 30 percent of the organization’s funding – also applied pressure by threatening to withhold funding for IDB if certain reforms where not implemented, including better governance and risk management. Public statements by U.S. officials including senator and chairman of the powerful foreign relations committee, Richard Lugar, and Treasury Secretary Timothy Geithner suggested that real changes at IDB were necessary if the U.S. government was to reload and bolster IDB’s capital base so the bank could be in a position to adequately respond to the recession and meet the development demands of the region. Long before 2008, relations with individual constituents were struggling as IDB and the region’s passionate civil society organizations clashed over the bank’s mandate, mission, and programming. Watchdog and civil society groups, both in the LAC and beyond, contended that IDB’s programmatic focus on infrastructure did little in the way of conserving or protecting the environment, assisting local communities, or alleviating poverty. The groups also lambasted IDB for a lack of transparency and poor strategic planning which culminated in the creation of the 50 Years of Financing Inequality coalition – a group of civil society organizations demanding drastic reforms within the halls of IDB’s Washington D.C. headquarters and across the countries receiving IDB financing. Believing that policy and program influence was largely surrendered to Washington and that the LAC political and economic elite who lead IDB were yielding to U.S. and private sector priorities, recipient governments – likely influenced by their voting citizens – started looking for alternative forms of financing that were available in the region before the recession struck. Indeed, as LAC countries were slowly becoming more self-determined prior to the global economic recession, they were already lessening their dependence on multilateral development bank finance, leading to a significant drop in IDB lending and grants. In a noticeable attempt to reconcile the public gripes of the past, IDB’s reform agenda was predicated on the management restructuring, the better use of technical knowledge to address specific country needs, and more emphasis on implementation and achieving results. The housecleaning helped lay the groundwork for the largest capital infusion in Bank history – the Ninth General Capital Increase, or IDB-9, which raised the bank’s ordinary capital by $70 billion in 2010. 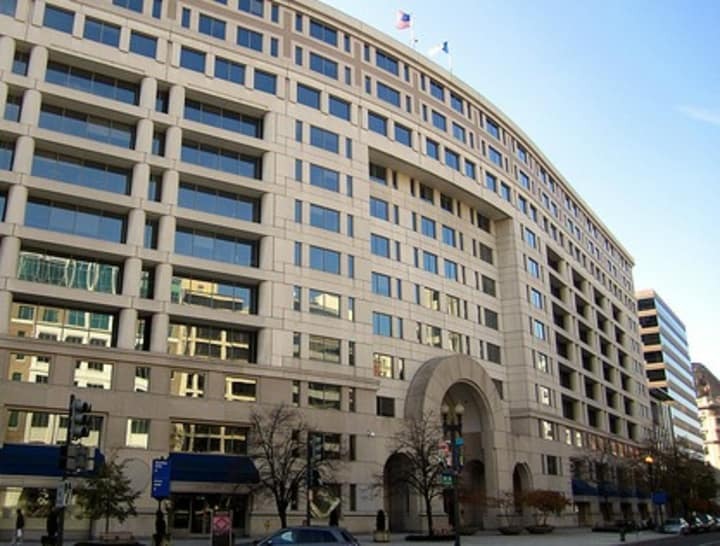 IDB-9 expanded the multilateral institution’s lending capacity to about $12 billion a year, as compared to an average of $7.8 billion between 1994 and 2008. By late 2010, IDB grew into a mammoth organization with $170 billion in lending and grant-making capacity courtesy of its member countries, including the United States, allowing the bank to better respond to the region’s development troubles and challenges, such as natural disasters and financial aftershocks from the lingering recession. Despite the U.S. shareholder position, over fifty percent of the bank is owned by borrowing nations which, analysts say, offers a more equitable structure of governance and will allow IDB assistance to be applied in a manner that fulfills its mandate in the region. Despite the substantial capital increase, the region’s composition presents additional challenges for IDB, requiring a unique development lending strategy. How does a single institution work to meet the needs of Brazil and Chile who have joined the ranks of upper middle-income nations, while at the same time healing earthquake-ravaged Haiti and responding to the needs of poverty-stricken Bolivia and Nicaragua? In a globalized and interconnected world, how does a regional development bank help its culturally and economically diverse member nations compete against other aggressively growing regions, including Asia? This is the world in which IDB is now operating – one that will continue to require the bank to recalibrate its aid programs and priorities, as well as strengthen its lending capacity to cater to a whirlpool of political and social changes in the region. Over the course of the last 30 years, the LAC region has been hit by an average of 32.4 disasters per year. Natural calamities, such as the devastating earthquakes in Haiti and Chile in 2010 and the Honduran floods in 2008 and 2011, claimed the lives of hundreds of thousands of people, displaced millions, and cost the region tens of billions of dollars in damages. Also, some 174 million people are still living below the poverty line – 73 million of which are living in extreme poverty or indigence, according the U.N. Economic Commission for Latin America and the Caribbean, or UNECLAC. The Organization for Economic Cooperation and Development’s Latin American Economic Outlook 2012 reports that ten Latin American economies rank among the 15 most unequal economies in the world and adds that, while conditional cash transfer programs have been successful in poverty reduction, the lack of social safety nets, as well as gaps in social and physical infrastructure leave citizens in LAC countries susceptible to external and internal economic shocks. “We hope, of course, to meet our goal which is to lend 35 percent of our total lending to more vulnerable countries. Last year, we were close to 32 percent. We hope to continue in that direction,” Moreno told Devex on the sidelines of the Asian Development Bank annual meeting in May. “That implies a specific focus on the bank in the more vulnerable countries, which are typically countries in Central America, some in the Caribbean and a couple of countries in South America but we understand that, in the end, our role is one of a development agency and as such we’ve got to focus on the countries that need more of our help,” said Moreno, addressing the social inequity across the region and other strategic challenges facing the bank. The capital increase was received amid a still evolving geopolitical landscape. From an initial membership of 18 countries, the bank now claims 48 member states and has country offices in 26 borrowing nations, a regional office in Asia, and an office in Europe. Its more than 2,000 employees work with a wide-range of organizations from central governments to private firms and nongovernmental organizations. Last December, the Community of Latin American and Caribbean States, or CELAC, held its inaugural summit in Venezuela – a country with leadership long at odds with the United States. Analysts generally agree that the mere creation of the CELAC – a new 33-member group of Latin American countries designed to strengthen integration within the Americas – in February 2010 aims to undermine U.S. influence in the burgeoning LAC region, as well as the influence of U.S.-led institutions such as the Organization of American States. A crucial test for the bank’s regional leadership came in 2010 as Port-au-Prince was pounded by the 7.0 magnitude quake that left more than 200,000 Haitians dead and destroyed whatever infrastructure existed. “[A] country that is very important in the work we do is of course Haiti which has tremendous challenges and we devote a large portion of our work and resources,” cited Moreno. The poorest country in the Western Hemisphere, IDB cancelled Haiti’s debt and has extended grant-only status to the country. The bank has pledged more than $2.2 billion in grants over the course of the next decade to support the country’s recovery, including $500 million in education assistance. Cumulatively since the disaster, IDB has approved $442 million new grants, disbursed some $335 million, and permanently stationed sector specialists to expand its many forms of technical assistance to the crisis-stricken Caribbean country. Empowered by the capital increase which will remain in place through 2021, the bank is doubling down on some sectors and expanding into others. While IDB has received some criticism for over-concentrating on infrastructure, Moreno, who was re-elected to his post in 2010, admits that infrastructure investment will remain a priority of the bank. “The region must tackle challenges in competitiveness and productivity, which are bottlenecks for private enterprise and progress,” he says. Based on Devex data (see chart), 974 out of 2,984 tenders from 2008 to 2011, or 32.64 percent, were focused on infrastructure across various sectors, including health, education, energy, water and sanitation, information technology, transportation, agriculture, and improving institutional capacity. In 2010, IDB approved $5.4 billion in loans for infrastructure. Private sector financing – much of which supports infrastructure development – is expected to receive $3 billion per year through 2015 from $1.4 billion in 2010. For a donor agency where almost all project administration and management is conducted away from headquarters and in borrower countries themselves, capacity building programs have also increased in the last four years and will continue to make up a large part of the bank’s programming. 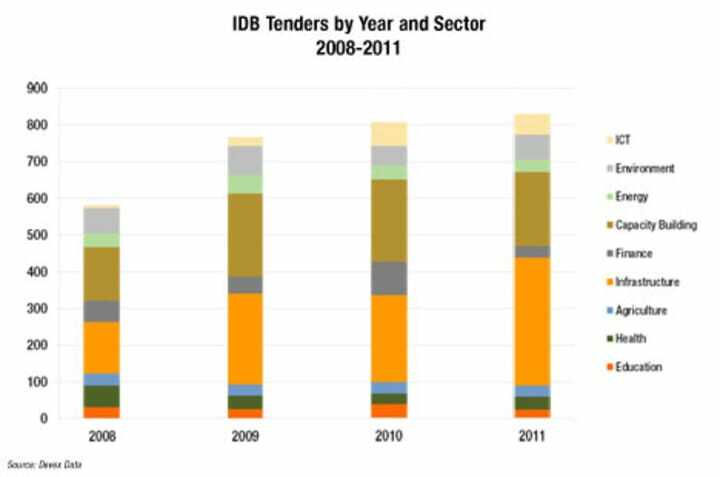 According to Devex data, IDB has issued 794 capacity building tenders from 2008 to 2011, or 26 percent of the total number of procurement notices. As all donor agencies and aid organizations move toward the use of country systems and promote country ownership of development programs, it is likely that institutional capacity building will continue to receive a significant portion of overall IDB lending. Critically, IDB prides itself on decentralized project administration processes, providing oversight support, policies and standards for procurement, but largely devolving all aspects of the project lifecycle to in-country executing agencies. Within the next four years, IDB will reportedly monitor the progress of recipient country compliance with internationally accepted practices in executing contracts and implementing projects to advance the bank’s transition to in-country systems. IDB is also advancing its commitment to combat climate change in a highly vulnerable region. Adopted in 2006, the bank’s Sustainable Energy and Climate Change Initiative was designed and is being implemented to move the bank away from fossil fuel-based energy projects and into an era of clean energy. IDB-9 mandates that environmentally sound renewable energy programs and projects account for 25 percent of IDB loans from 2010 to 2015 so it would be reasonable to expect partnering opportunities to increase in this sector. Loans for environment-related projects have increased from 6.2 percent in 2006 to 27.6 percent in 2010, to total $3.6 billion over 42 different loan operations. Green private sector initiatives in particular will get a financing boost for 2012 as IDB is expected to approve more than $700 million in funding for private sector projects on renewable energy, particularly wind, solar and hydropower plants. This year, China and IDB are set to launch an investment platform that will mobilize about $1 billion for equity investments that will promote sustainable development in the LAC region. IDB has also established a series of donor partnerships with the Asian Development Bank, European Bank for Reconstruction and Development, African Development Bank and World Bank to standardize climate risk methodologies and greenhouse gas emissions inventories, and establish consistency for recipient countries to evaluate climate change finance options. Another more-strategic priority for Moreno and IDB is youth development – tapping the 200 million people in the region below 30 years old that the president views as a distinct economic advantage. Furthermore, at the conclusion of IDB’s 53rd Annual Meeting of the Board of Governors in March, Moreno announced a special fund worth $300 million that will seek to provide security and lower the region’s high crime rate. Loans for small businesses, fiscal efficiency, social inclusion, poverty reduction, and anticorruption initiatives will also figure extensively in IDB’s portfolio. After a rocky period, there are some signs that IDB has learned some hard lessons and reforms have succeeded. Many believe the bank is not only larger than before, but also far more capable of positively affecting an increasingly progressive and economically diverse region. Questions of inequality remain however – both among countries and within countries. With Moreno at the helm, the next few years will tell if IDB is really ready to serve the dynamic region by building up weak governments, establishing the right mix of social safety nets, and fostering the infrastructure that will lead to regional integration, global trade opportunities, and economic growth. Louie-An Pilapil contributed to this report.